If your car is 5 years old or older you probably have noticed that the headlight lenses are getting cloudy and/or have a yellowish tint to them. Not only do fogged up lenses create a dangerous condition for driving at night; they also scream out that the car is old and ugly. According to used car buyer IQ Auto buyer even a Mercedes-Benz S Class looks like a junker when there are two milky cataracts where the headlights should be. So how do you get back that crystal clear look (that actually adds value to your car if you’re thinking about selling it) short of buying new lenses? Well there are a slug of methods on Youtube and other places, some good some bad, but almost all of them are temporary fixes that will have you cleaning your lenses again in a few short months. The only permanent method (with permanent being defined as 2 years or more) is one that is very similar to what body shops use. It’s cheap (about $10 a headlight) but it is labor intensive meaning the results will only be as good as the effort put in. If you want a quick fix you can use toothpaste, Windex and a sock and be back at it in a couple of months. If you want amazing, long term results then read on. Lens covers are made from durable, scratch resistant polycarbonate plastic with several layers of clear coat paint on top of them. Over the years, the clear coat is chipped away allowing UV rays and road grit to damage the plastic and that’s what causes the fogging. The permanent fix involves wet sanding the plastic to remove the damaged layer and applying clear coat to the newly exposed layer. Because we are going to be spraying clear coat and sanding, you want to start by taping off the headlights and protecting the body paint in the area. 1. Cut the trash bag in half so you have a flat sheet of plastic. 2. Use the painter’s tape to tape off the headlight at the edges. 3. Place the plastic sheet over the headlight and surrounding area and secure with a few pieces of tape. Use the scissors to cut out a hole around the headlights. It doesn’t have to be perfect because you have the wide tape underneath. When the area is protected you are ready to rock and roll. Most of the time you spend on this project (1.5 to 3 hours for both lights depending on condition) will be on wet sanding. Regardless of the grit you use the technique is always the same. – This is wet sanding. The water acts as a lubricant. Make sure both the lens and the sandpaper is always wet. – If your lens is in crappy shape start with the 400 grit paper, otherwise start with the 600 grit. – Use a circular motion when you start. The lens will get cloudy and that’s a good thing because you are grinding off the damaged plastic. Finish the sanding using side to side strokes. This creates horizontal scratches which gives the clear coat something to adhere to. – If you started with 400 grit go to 600 grit and repeat the process. If you started with 600, take a paper towel and clean the lens with rubbing alcohol before starting the 2000 finishing grit paper. – When you are finished with the 2000 the lens should look markedly better and be smooth to the touch. Clean the lens with alcohol in preparation to applying the clear coat. – The trick to the clear coat are light even coats. If you spray it on to thick it will run. Put on a light coat and give it 5 minutes to dry. Repeat this until you have 3 coats on. – Give it 24 hours to completely dry and then apply the car wax you use on your car. 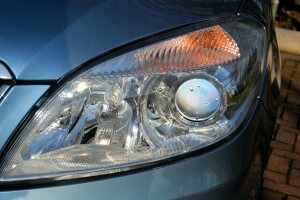 Your headlight lenses will look almost new and your car will look great!